Sure, New York City is crazy crowded with taxis, pigeons, and a billion humans (two-thirds of which are terribly annoying). But it also has some of the best places to run in the entire country, with running paths so picturesque they can almost make you forget how outrageous your rent is. 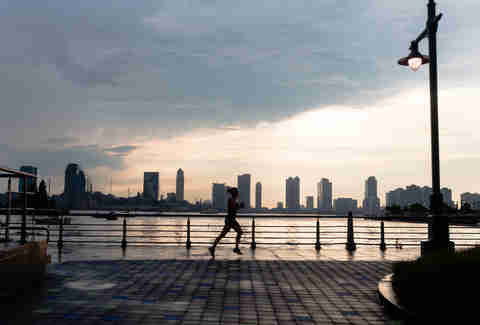 To prove it, we found the most beautiful running routes in New York City that are sure to give you that push you need to get off your couch and start working out. This route begins at the tip of Manhattan in Battery Park and is sure to divert your thoughts from the torture -- er, physical exertion -- that is running. 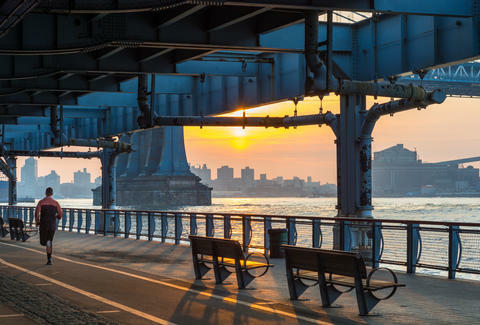 You’ll score glimpses of the Statue of Liberty before rounding the edge of Manhattan and heading up the East River running path for more (running, that is). Once along the East River you can feast your eyes on views of Brooklyn’s waterfront; the Manhattan, Williamsburg, and Brooklyn Bridges; and the South Street Seaport. And if you want to break off the path and head into Brooklyn, you’ll have plenty of opportunities to do so -- just follow the signs for the bridge of your choice! If you don’t instinctively think of Central Park when you think of Manhattan and running, are you even a runner? Dumb question: of course you aren’t. But here’s a less obvious fact: the iconic park is a great place to run, but the tough, rolling hills sometimes make us reconsider our route. 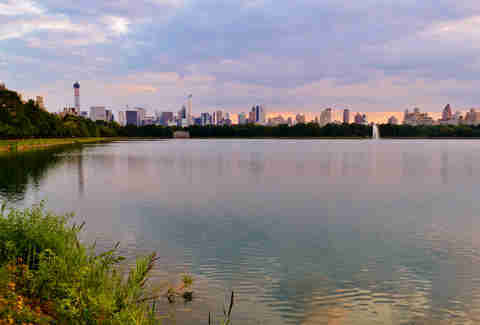 For a flatter surface that also comes with majestic reservoir views (especially at sunset or sunrise), try running loops around the Jacqueline Kennedy Onassis Reservoir. Located centrally within the park from 85th St to 96 St, the 1.58-mile path is perfect for multiple loops. The best part? It’s free of cyclists (no offense). Want to forget you’re in Manhattan? 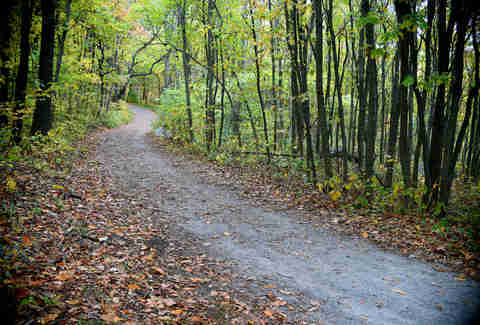 You can make it happen by trekking uptown to the trails of Van Cortlandt Park in the Bronx. Without a skyscraper in sight, you can beast through speed workouts on the park’s 400-meter track or get in touch with your inner Bambi by jogging along the various cross country trails inside the “urban forest” (which, no, is not a phrase we just made up). The park is home to 1,146 acres, over 14 miles of trails to explore, and a house where George Washington actually slept -- so it’s worth lacing up your sneakers and hopping aboard the 1 Train to check out. New Jersey may not be very exciting to stare at (even for those who were weirdly captivated by Jersey Shore), but when you run north along the West Side Highway you’ll be able to take in epic views of the George Washington Bridge -- and if you run far enough, the Little Red Lighthouse. While the path is typically crowded during peak weekend hours, early morning hours (both on weekdays and weekends) are quieter and less congested. And if you need some motivation to log a few extra miles, know this: the farther you run Uptown, the less pedestrians you’ll need to dodge! Hudson River Park is a mecca for other fitness buffs (you’ll see them, we promise) and those who just like to take their activity outdoors. 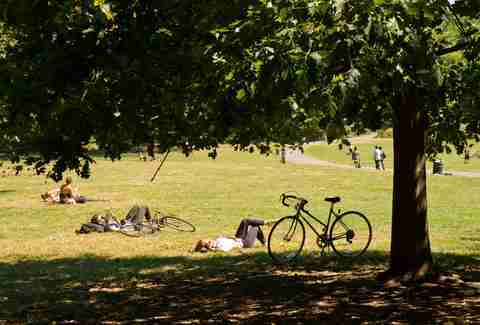 So if you’re looking for a workout buddy or even somebody to, ahem, hold your feet during crunches, this is a great area to get your mileage in. As you take on the pedestrian path which parallels the Hudson River, you can get get inspired by all the other activities going on (and create your summer bucket list): think paddle boarding, kayaking, recreational sports, and even outdoor bootcamp classes. The views of the Hoboken Terminal and the Hudson River aren’t terrible, either. 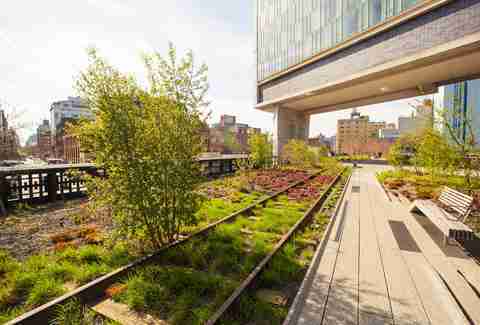 Running on the High Line -- the 1.45-mile-long linear park built on an elevated section of an out-of-commission railroad line -- is like taking a breath of fresh air (literally, because you’re above the sewers). You’ll score views of the Hudson River and the Meatpacking District in addition to street art, sculptures, and picturesque gardens. It’s basically an Instagrammer’s dream -- which is why we recommend only venturing up there in the early morning, before it gets taken over with selfie-taking tourists. While this Brooklyn-based green scene may be smaller than the giant oasis that is Central Park, that unfortunately doesn’t mean it’s any less hilly. However, it does mean the loops you’ll run are shorter, with the outer loop of the park amounting to 3.68 miles (as opposed to Central Park’s six). Take in the sights (Prospect Park Lake, the Bandshell, lots of nature) and sounds of many recreational activities as you explore the 585-acre oasis on foot. After you finish up you can grab a post-run meal (or beer) at the park’s Bluestone Cafe. While this island has a spooky history (formerly Blackwell Island, the archipelago housed a grim penitentiary full of convicts for a century), you’re more likely to find toddlers than inmates living there today -- though we’re not sure which option is scarier. 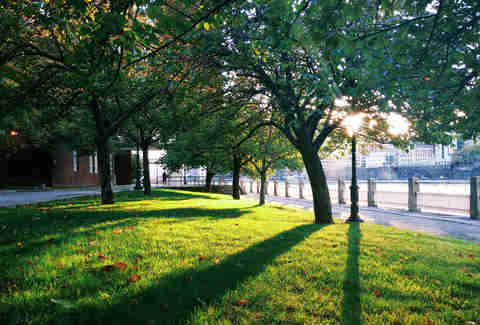 Located between Manhattan and Queens, Roosevelt Island makes for a short, flat, and scenic run. As you make your way around the island’s 3.6-mile perimeter, you can take in the scenery of Midtown Manhattan and the Queensboro Bridge without any taxi horns or obnoxious tourists testing your patience -- which is very important, because road rage can happen even to the nicest runners. If there’s one place you should never run at 1pm on a Saturday, it’s the Brooklyn Bridge. The historic structure will be insanely crowded, giving you a 90% chance of being hit in the face with a selfie stick. However, if you want to run over to Williamsburg at 6am on a weekday, we strongly recommend it. Not only is the architecture of the Brooklyn Bridge pretty amazing to gaze at, but you’ll also have the opportunity to catch glimpses of both upper and lower Manhattan. Once over the bridge, hang a right and make your way to Brooklyn Bridge Park for some more panoramic waterfront views of lower Manhattan. Erin Kelly is a writer, runner, and triathlete living in New York City. Her favorite place to run is the Manhattan Bridge because less people run there and people annoy her. Follow her at @erinkellysays.